This methodology was developed over the last twenty plus years by business managers and successfully used in hundreds of businesses and thousands of business segments. 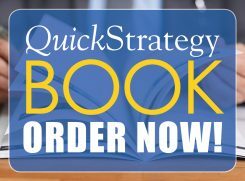 In all instances, companies have profited by implementing this unique strategic framework for business decision-making. The easy to use two-page format can be put to work in less than one week. Continuous online support allows you to see how you must adapt your strategy to changing market conditions by monitoring customers, competitors, market alternatives, and externalities.